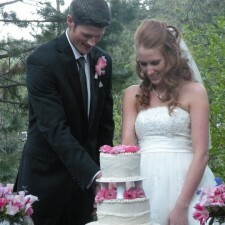 Alison and Victor cutting their homemade cake! 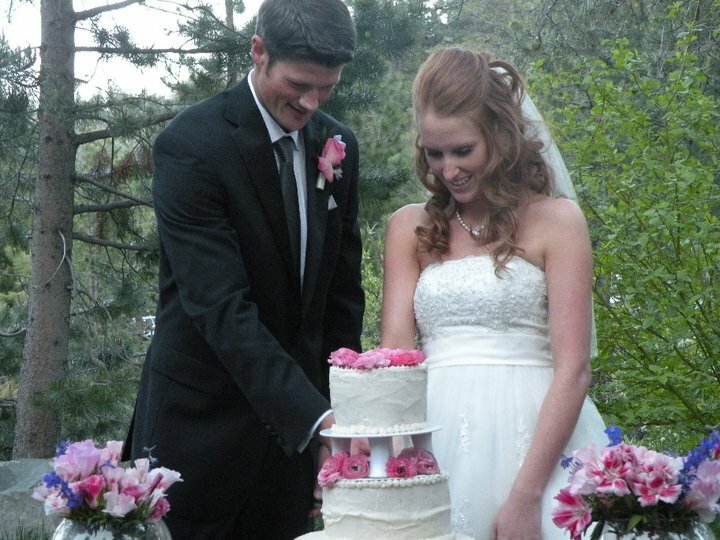 I told you before that my mom and I made my wedding cake (which was seriously the best wedding cake I’ve ever had. The single bite I got that Victor fed me was good anyway. Darn that caterer for not saving me a whole piece!!) This cake, should it last that long, stays awesome and doesn’t dry out for a week. Anyway, here’s the recipe for my chocolate peanut butter wedding cake, scaled down to one (normal sized) cake. Mix together all but chips, beat 4 minutes. Add chips. Pour into greased bundt pan and bake 350 degrees for 45-50 minutes. Cool 10 minutes, ice with peanut butter cream cheese frosting. My cake actually used this as the filling and then had white cream cheese icing on the outside, but definitely did not need the extra sugar. Actually, if you aren’t a huge peanut butter person, the cake really doesn’t need frosting at all. But where’s the fun in that?